Acclaimed drama "TRI," which earlier this year walked away with the top prize at the Northern Virginia International Film & Music Festival, begins at the Strand Theatre, Delaware August 19. The screening coincides with the Ironman race in Delaware on Aug. 21. "TRI" was also a Runner Up for Best Cinematography (Feature Film) and Best Editing (Feature Film). "TRI" is an inspiring, emotionally-charged drama about a medical technician with a history of not finishing things who is inspired by a cancer patient to sign up for her first Triathlon. The film’s potent garland of performers includes Jensen Jacobs and legendary TV star Tim Reid. 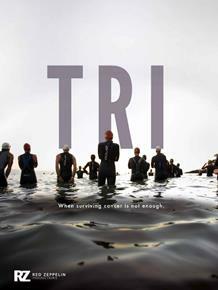 "TRI" is the first scripted feature narrative about triathlons that has been developed for theatrical release. The concept of "TRI" is to raise awareness and hope for those who are seeking compassion or understanding while dealing with cancer as a caregiver, a patient and a survivor. The writing team for "TRI" includes a two time Ironman finisher and professional triathlon coach who has led cancer awareness programs; a cancer survivor; and, an award winning screenwriter who has lost loved ones to cancer.